SOLD OUT AND DISCONTINUED...Personalized shower caddy for college. Fill it with all your favorites, for a great spa basket or graduation gift. Keep all your shower essentials in one convenient place with our shower caddy with 7 breathable mesh side compartments. Popular paisley pattern in trendy navy, coral and white. Four bottom drainage holes. Perfect for all bath and beauty products. Includes name or three letter monogram. 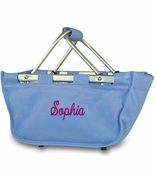 Lightweight monogram spa shower caddy measures 10"W x 7"H, generous 8.25" across bottom. Washable. I bought three of these for the senior girls on my basketball team. I think they will love them. Turned out great and got them quickly.